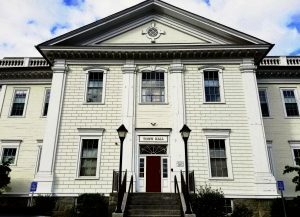 The Danvers Board of Health consists of three members appointed by the Town Manager to staggered three year terms. As they are volunteers, their authorities are carried out by the staff of the Health Division of the Department of Planning and Human Services. The Board of Health generally meets on the first Thursday of each month at 7 p.m in the Town Manager's Conference Room in Town Hall. Members: Dr. Thomas McLaughlin, MD (Chairman), Edmund Kowalski, and Dutrochet Djoko.